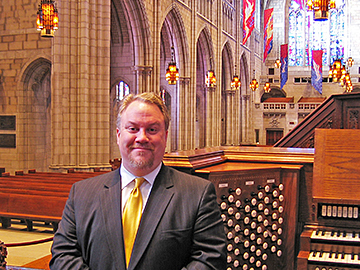 MUSIC-MAKER: Princeton University Organist Eric Plutzs responsibilities include playing for weekly services at the Chapel, official University services, solo concerts, and accompanying the Chapel Choir in services and concerts. He also coordinates the weekly After Noon Concert Series at the University Chapel, which is being held this fall on Thursdays from 12:30 to 1 p.m. The organ is the most mechanical, most difficult instrument to make music on. There are so many things obstructing the creation of music. But when its played brilliantly, theres nothing else like it. I practice a lot. Princeton is an extraordinary place to be. I can think of only three or four places where you just get to play the organ. I love to focus on organ playing, and Im very lucky to be here. When we went home, I went to our church organist and asked for lessons. By the time I was a junior in high school I knew that I was going to be doing music. I auditioned at Oberlin and Westminster Choir College for both piano and organ. I was accepted at both; I loved Oberlin, but Westminster offered me a better financial package. It turned out to to be the best four years of my life. During my sophomore year I was encouraged to really focus. I was talented and had been getting by without doing much work. It killed me, but I gave up my piano degree. I thought I was a better organist than piano player, and it would be easier to make a living as an organist. Im very happy with what I did. I came here in February of 2005. I graduated from Westminster Choir College in 1989, and so was familiar with the Chapel and Princeton University. Even though theres no official connection between the two institutions, theres a collegial relationship. The Choir College holds its commencements at the Princeton Chapel, and it was always a thrill to come and hear an organ in such a different acoustic than any other building in the vicinity. However, at that time, the organ was not in such great shape; it was in great need of renovation. But I was honored to play the anthem of the graduating class, which was the only time that an undergraduate organist could participate in a commencement. After I graduated I went to Eastman, and heard through the grapevine that they had started the restoration of the organ, which was fantastic. Afterwards I came back  there was a series of concerts  and was just blown away, especially since I had heard it in its earlier state. The main goal for any organ builder is to provide a complete instrument. This was a sizeable instrument, and it still is the largest in the area. But it had changed through the years, especially under Dr. Karl Weinrich, who was here from the late 50s. He wanted the organ to more authentically play the music of Bach, and that was not one of its original missions. But it was the time of a Bach renaissance and he changed it by replacing the sounds that were broad and full with smaller sounds that Bach would have known. Parts of the organ he left alone, so in some ways it was schizophrenic. The bottom line was it wasnt complete. Many mechanical things at the console were also beginning to fail. As a result of the restoration, the organ was returned to its original intent. It sounds complete now. The old 1928 pipes were filled in and the placement was changed in the chamber, so the pipes could speak even more presently into the room. Its a wonderful marriage between the instrument and the room. After the renovation, there was no university organist, and a rota of upperclassmen and graduate students would come and play. It was fairly loose, and there was a sense that there should be a more stable, full-time arrangement. I play for the 11 oclock Sunday morning service, for official University services, and at the baccalaureate services for graduating seniors. One of the years emotional high points occurs in February when alumni come back and I play at the Service of Remembrance for classmates who passed away that year. One of the first funerals I ever played was for Tom Gibney, a fairly well-known folk singer. I had not been here long, and when you first start a job, you say yes to everything. I was asked to play a hymn in a certain way. It turned out to be an incredibly moving service; three or four hundred people began to sing along. We say yes to whatever music people want for funerals. If they want a marching band, we will find a marching band. Funerals happen quickly, usually with little planning. For weddings, theres lots of planning and we can suggest certain music. Sometimes I say, Im going to say this just once, but Im going to encourage you to rethink that. In 30 or 40 years, is that really what you want to remember? A couple who wanted When Im 64 ended up opting for classical music. What I love about weddings here is that every one of them is different. There are Jewish, Quaker, Roman Catholic, Presbyterian, and Episcopal weddings. Some of the most enjoyable weddings are done by justices of the peace. I look forward to playing concerts here but also play beyond these walls. Ive played at Verizon Hall in Philadelphia, and will be playing the worlds largest working organ, the Wanamaker at Macys in Philadelphia, on October 31. Some of my favorite composers are Maurice Duruflé, Johann Sebastian Bach, and Louis Vierne. Mostly I enjoy their music because of the effect it has on me. Duruflé successfully combined ancient music (Gregorian Chant) with modern harmonies (French Impressionistic) to create other-worldly sounds. Whenever I play his music, I consider it a great honor, almost as if I am getting a glimpse of what he must have heard in his head. I dont know of any organist who doesnt deeply respect the music of Bach. There have been any number of composers whose chosen instrument was the organ, but none holds a place of such authority. The more one studies the music of Bach, the more one sees the unfolding secrets and connections. Viernes music is more visceral than the other two, and perhaps thats why I enjoy it so much. It is orderly in its own way, with its own harmonic language. All wrote truly amazing music. On a very analytical level, Im focused on the means to the end: playing the right notes at the right time, so the people listening have the product that Im hearing in my head. Sometimes the sheer sound of the organ can make your heart skip a beat.